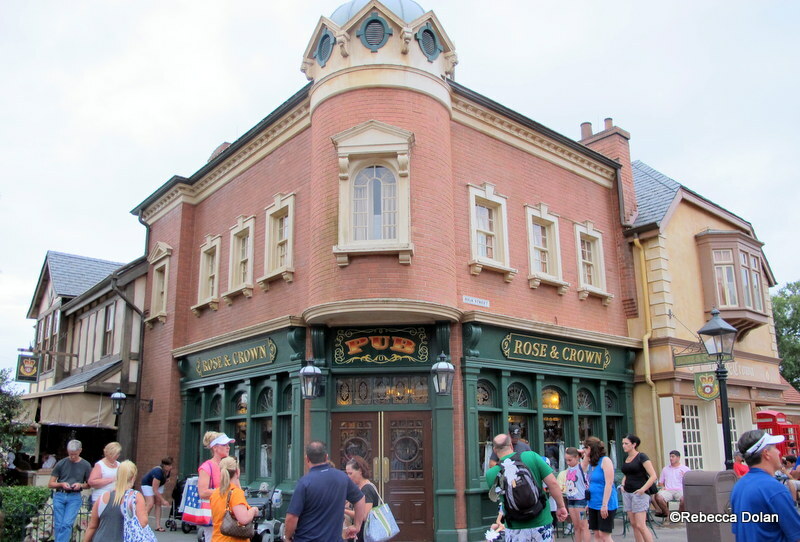 The Rose and Crown Pub and Dining Room in the World Showcase at Disney World’s Epcot is an authentic English pub dropped into sunny central Florida. And we love it. Like “can-we-move-in?” love it. 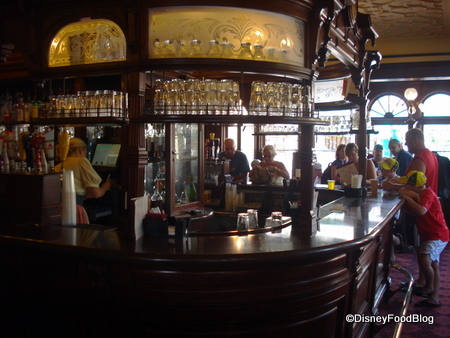 For years, Rose and Crown has earned a reputation as a classic World Showcase spot. Diners satisfy their need for English comfort food like fish and chips and cottage pie while enjoying some of the best pints found in the Parks. 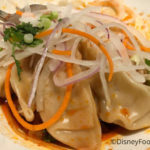 But many visitors to Epcot don’t realize that the no-reservations-needed pub here has an incredible (though small) food menu and atmosphere! Plus — Carl the Bartender! We know, we know. You want in. Rose and Crown Pub and Dining Room gets high marks from diners for the restaurant’s authenticity, and it all starts with the curb appeal. In fact, Rose and Crown features architecture from three different centuries on its exterior, which is in keeping with the period architecture found throughout the United Kingdom pavilion. Inside Rose and Crown, you’ll find what feels like the perfect pub from across the pond. It features lots of dark wood and tons of pub-tastic details. 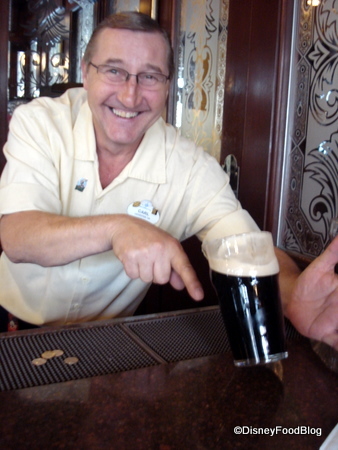 Aside from some killer beverages, another crowd favorite of Rose and Crown’s Pub is Carl, one of the most beloved Disney World Cast Members. We definitely recommend stopping in for the best kind of Disney history along with your brew! 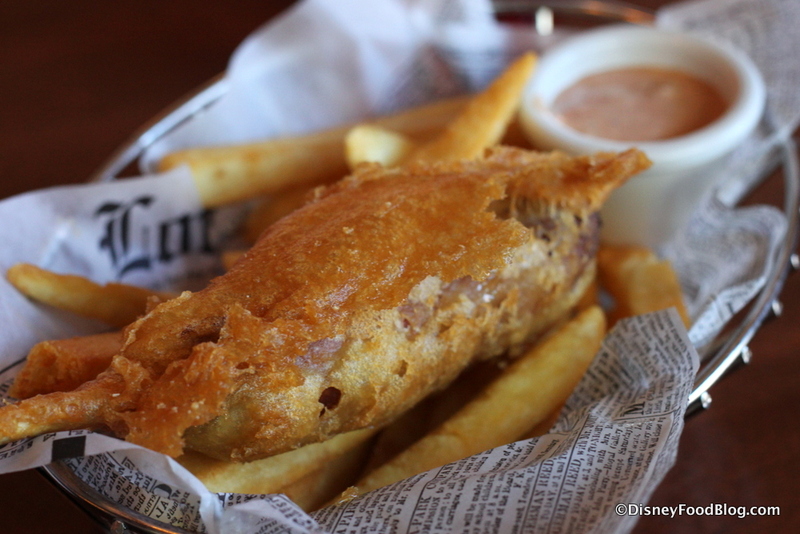 The pub menu here is excellent and worth a try — especially if you find yourself in the World Showcase without a coveted ADR! 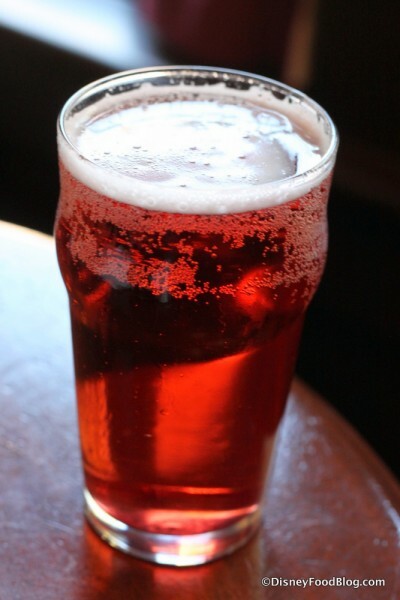 Of course, I never stop at Rose and Crown Pub without grabbing a drink, and they have lots of unique and familiar options to choose from. On this visit, I went with a Cider and Black. 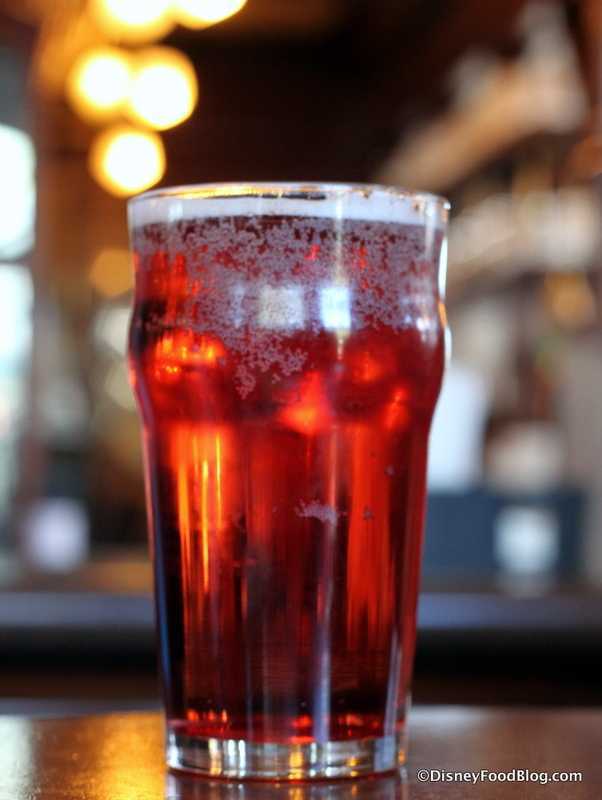 I love the jewel-like color of this cider — this one is a combo of Strongbow and Blackcurrant Cordial. Its light, slightly fruity flavor is probably best suited for those who prefer lighter beers and ciders specifically (this will NOT scratch your Guinness itch), but it’s right up my margarita-loving alley. I had some high expectations for this since I almost always order the Bangers and Mash in the dining room here (and it is always terrific!). Thankfully, I was not disappointed! Granted, it might not be the most visually appealing basket of food I’ve ever seen, but it strikes all the right notes for pub food. 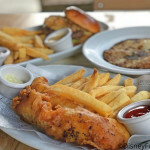 There’s the golden brown, deep-fried batter; thick-cut, English style chips; and a newspaper lining. It doesn’t get any better than that. And it tasted incredible! The traditional English sausage was super savory and flavorful — so much so that I was actually pretty impressed as it caught me off guard. It was satisfyingly crunchy, too — exactly what I expected. The menu describes the dipping sauce as Branston Mayonnaise, and with a little digging we found that this British brand of mayo is the Sweet Chili variety. It was tangy with a hint of savory, and it was a textural and flavor foil to the dynamic Banger (and its tastebud-blasting, battery, crunchy goodness!). Juicy, crunchy, tangy, salty: the Battered Banger really has it all. Highly recommended. Now, we gotta be real: it’s kind of a bad news/best-news-ever scenario here. The English Bulldog that we looooved is gone from the Rose and Crown Pub Menu. Sadface! But it’s been replaced by THIS, so giant smiling happy face! It’s the yin/yang of manipulated sausages, friends. But you won’t be disappointed! I would definitely order this again. Everyday. Forever. At $9.99, it’s a terrific value (and hefty enough to serve as a full meal!). Really, when you’re eating at Rose and Crown Pub and Dining Room, it’s a transportive experience, and the food is a very big part of that experience. With dishes like this on the menu, you can bet we’ll be back. A lot. 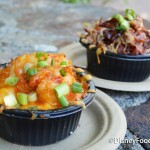 What is your favorite World Showcase dining experience? Let us know in the comments! 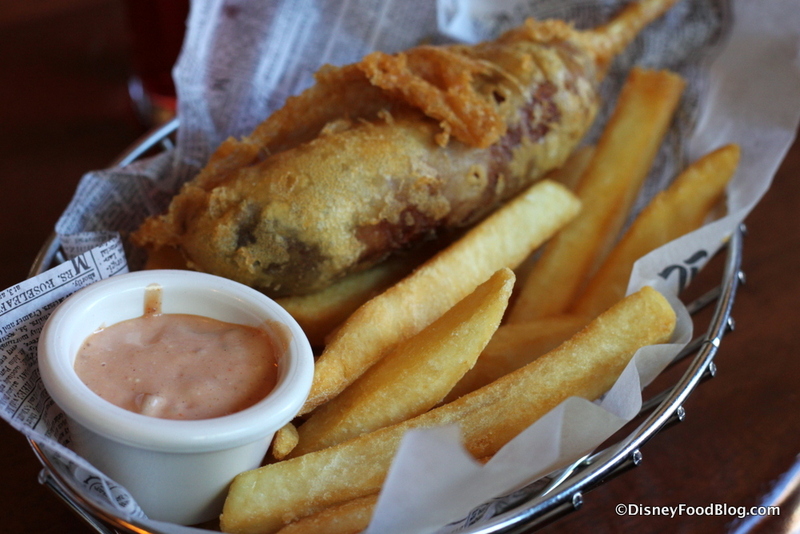 Great to see this added to the menu and,as a Brit who enjoys my food, I can vouch for the authenticity of this item – fish and chip shops in the UK offer battered sausages; only difference is they won’t present it on a stick (in the style of a corndog). 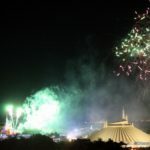 I love Teppan Edo, Le Cellier and the Norwegian Bakery, but the UK is on my list for my next trip. I’m very excited about eating here and having a hard cider like I enjoyed when I was over in Britain! Essie — We can’t wait to hear what you think! Branston don’t make mayonnaise any more. I wonder if what you were served was mayo blended with Branston Pickle? https://bringoutthebranston.co.uk/range/pickle/ or might have been the smooth, squeezy version if there were no lumps. 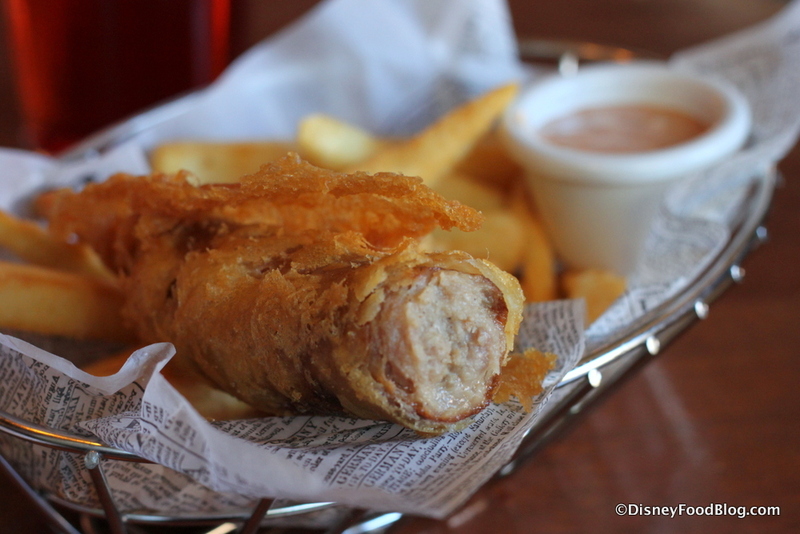 Josh — Raglan Road Irish Pub and their counter service location, Cooke’s of Dublin, also offer battered sausages. If you haven’t tried them, check them out! Find them at Disney Springs. Dec 2017 my daughter and I ate at the Rose and Crown and our WONDERFUL waitress, Alicia, suggested Bangers and Mash. I LOVED LOVED LOVED it!!! Must find the recipe as made in this establishment. Wonderful! !